chicagotribune.com wrote: A Hobart woman found a Portage Police Department K-9 that went missing early Wednesday, an official said. cbs19.tv wrote: Vlinder, a 2-year-old Dutch Shepherd, and her handler Jeff Davis make up SGT K-9. The inseparable pair stands ready and willing to help the community prevent drug abuse. Marine Corps veteran Davis became an entrepreneur specializing in drug detection and prevention in July. ndtv.com wrote: According to Al.com, Nitro the police dog is a two-year-old Dutch Shepherd who joined the canine unit at Alabama's Gulf Shores Police Department earlier this year. spacecoastdaily.com wrote: Sheba is a Dutch Shepherd, and in the past, she tracked and apprehended six suspects and was involved in numerous non-physical subject controls where she prevented further revelation on scene just with her presence. The Palm Bay Police Department’s Canine Unit is among the best and most highly trained in the State of Florida. thegeorgeanne.com wrote: Recently, an honorary team member of the Georgia Southern Police Department was re-certified for his first time. However, he probably isn't who (or what) you might be thinking of. Meet Deimos, a three-year-old Dutch Shepherd. He specializes in detecting explosives, and has been working with GSPD for nearly two years now. newschannel9.com wrote: His name is Jäger, and he’s a Dutch Shepherd. Jäger was bought last August who is certified as an official multi-purpose dog for the agency. Jäger’s certifications include tracking, criminal apprehension, building searches, and narcotics detection. nbcdfw.com wrote: Crime Stoppers of Wise County is offering a reward of up to $2,500 for tips leading to the safe return of their missing K-9. 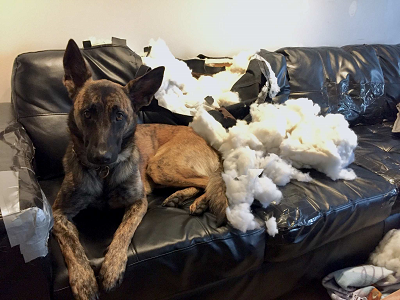 Rayco, a 4-year-old Dutch Shepherd, was in his kennel outside when strong storms moved through North Texas in late October, destroying his kennel. This story has an interesting twist. Read it to find out what happened to another K9 Officer (Mal) on the same day Mikey returned to work. abqjournal.com wrote: A Fresno County, Calif., Sheriff’s K-9 officer has returned to service about four months after a gunshot wound to his paw caused brief uncertainty if he’d be able to work again. But Mikey, a 6½-year-old Dutch Shepherd, successfully performed all the tasks he previously was trained in without showing signs of his injury – and with two fewer toes. Anyone know what a Malinoan Belgian shepherd is? theyucatantimes wrote: Rescue efforts implemented by the K9 Squadron of this agency involved intensive work by canine agents Dexter, a Dutch shepherd, and Samo, a Malinoan Belgian shepherd, both specialists in the detection of bodies on land and water, as well as their human partners.